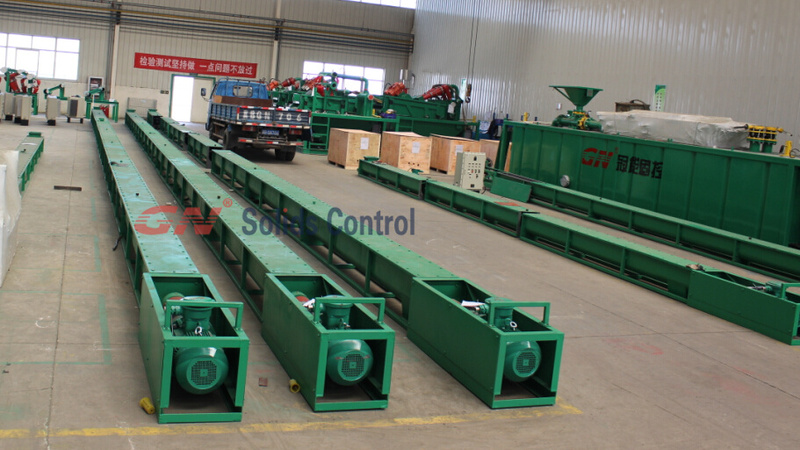 The drilling waste disposal screw conveyor is ready to be sent to the African site. The former African customers have ordered the chip dumping machine and the cuttings centrifuge in our company. At present, the screw conveyor has been tested and completed, ready to be packaged for shipment and delivery. The screw conveyors ordered by African customers are specially supplied to the on-site drilling platform for conveying waste cuttings management. The screw conveyor produced by GN Solids Control is mainly used for waste treatment and drilling cutting of drilling fluid. The screw conveyor is the auxiliary equipment for the drilling mud solid phase separation and drying system equipment. The screw conveyor produced by GN Solids Control can be combined with other The transportation equipment is used together, and the screw conveyor completes joint transportation, separate transportation, mixing, blending, dehydration, compounding, unloading and stacking. GN Solids Control technicians use a custom designed screw conveyor as part of the waste processing system. The screw conveyor is designed to be 12 feet per section. This design of the GN Solids Control enables the screw conveyor to act as a screw conveyor. The replacement of standard consumable parts greatly reduces the convenience of customers on site. The spiral blades of spiral conveyors produced by GN Solids Control are made of wear-resistant materials to ensure their longevity is longer than the same type of products in the same industry. The screw conveyor produced by GN Solids Control is the main unit of transportation work in most industries, which can reduce the labor intensity, improve work efficiency and wide application range. Applicable to all industries, such as mud does not fall into the cuttings, building materials, chemicals, electricity, metallurgy, coal, grain and other industries, suitable for horizontal or inclined transport of powder, granular and small block materials, such as coal, ash, slag, Cement, grain, etc., a wide range of products, our company welcomes customers to inquire. How to operate a Mud gun?